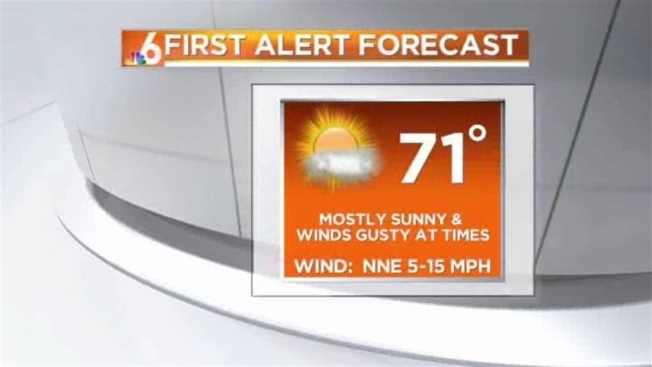 After a temperature roller coaster ride all week, a gradual warm-up is expected starting this weekend in South Florida. Friday will be mostly to partly sunny, with gusty winds at times and a high of 71. Lows will remain in the low 50s Friday night. Temperatures will remain in the mid 70s on Saturday and Sunday with a mix of sun and clouds. Rain will remain out of the forecast for the start of the workweek but temperatures will continue to warm up. Highs on Monday will rebound back into the upper 70s. The drier air will move away during the week and the moisture returns to South Florida as a cold front approaches for Wednesday. The cold front will allow for showers to return to South Florida for Wednesday and then cooler temperatures for the second half of the week.